"Subscribing to the highest human values - self respect, self reliance, service to the community and respect for mankind"
The Maharana Mewar Foundation Annual Awards constitute a major part of the activities of the Maharana of Mewar Charitable Foundation. From a modest beginning of awards limited initially for the scholars in Udaipur, the range of these awards has steadily grown to become an event in the domestic and international arena. Today, the Awards honour the recognition of service of permanent value already rendered to society. It recognise eminent scholars, students and common citizens who, through their chosen field of study and activity, have contributed to the society. 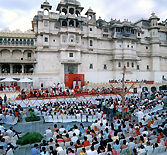 MMCF provides pensions to the old staff members and retainers of the House of Mewar. 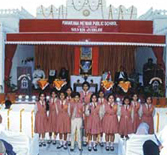 Under the sub-title Parvarish, in the charter of activities, a number of persons receive charity from the Trust. Parvarish under RGKCT awards stipends and pensions to the erstwhile women staff members of the House of Mewar.The objective of this scheme is to provide an anchorage to the women and children, particularly of Mewar and Rajasthan, so that in the long run, they not only develop a sense of security but are able to be completely self reliant. 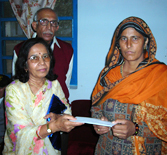 Rs 11000 paid to each 22 war widows of 9 Grenadiers (Mewar) in 2007. 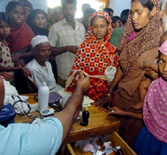 Medical aid is an important activity of the MMCF. The common citizen of Mewar, and other precincts in Rajasthan can apply for medical benefits and assistance. Medical aid is granted in many differing situations. The treatments can range from assistance to geriatrics to monetary reimbursement for social workers for distributing medicines to poor and disabled people in villages. MMCF also runs a charitable dispensary, within the City Palace. It operates all year round and aims to provide free medical counselling and medicines to the poor who are unable to afford private medical treatment. These cover a diverse range of charitable expenditure. The areas can be as disparate as medical expenses to the upliftment of the poor and backward members of Mewari society. Donations have been made toward sports, astrology, educational institutes, arts, women's promotion, cultural institutes and centres of learning etc. Financial assistance in the form of donations is also given for medical and other miscellaneous purposes. Donations in the form of medical assistance are also offered to women and made towards assisting in marriages or benefitting children's funds etc. 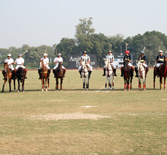 HRH Group of Hotels has been the Hospitality Partner for Amity Polo Cup for Charity fulfilling its CSR programme, supporting the Amity Humanity Foundation in its commitment toward empowering the girl child. Over 250 children from orphanages were offered regal visits of boat ride in Lake Pichola, visit to Jagmandir Island Palace - a palace on an island in Lake Pichola as a CSR activity, promoting socially responsible tourism. Vishranti Grah (environment friendly low cost houses) are proposed at important rural sites where Maharana Mewar Manav Dharma Trust is present. Establish / construct and maintain food courts serving traditional simple indian meals on no profit no loss basis or even subsidised basis by Maharana Mewar Manav Dharma Trust. All works related to drinking water provision in villages such as installation of tube wells, water huts, water coolers, piyao, tanks, water harvesting and related activities by Maharana Mewar Manav Dharma Trust. Create an Institute of Excellence dedicated to women's vocational and artistic educations by RGKCT. The business and charitable organisations under Eternal Mewar continuously engage in humanitarian activities.